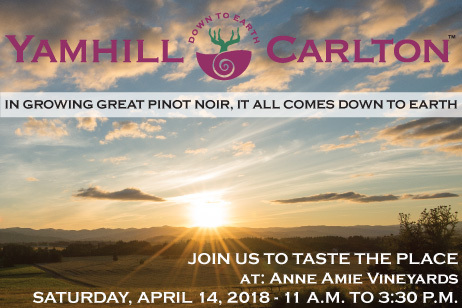 WildAire will be pouring at our favorite event again this April: The Yamhill-Carlton AVA Spring tasting at Anne Amie Vineyards. April 14, 2018 from 11am to 3:30pm for the 9th annual Spring Tasting Event at the always-spectacular Anne Amie Vineyards, 6580 NE Mineral Springs Rd, Carlton OR 97111. Last year, the wine concierge service was very popular so it will be repeated. This year, we plan on adding an outdoor seating area. Please stop by for a taste and select a bottle to pair with your evening meal or browse from our selection online!